The overall goal with GIS and geospatial mapping is to create a clear, realistic picture from which you can make more informed business and operational decisions. These map-based formats consolidate and transform traditionally complex and uninspiring tabular data, topography and statistics into a vivid, 3-D picture. This provides unparalleled insight into problems and highlights areas of growth and potential. As a leader in ESRI and the Google Map application platform, we can deliver these services via desktop, web and mobile platforms. TriShulla’s goal is to provide private businesses and government agencies with a strategic tool that optimizes business and operational forecasting, minimizing investment risk and loss of profits. Clients often utilize GIS mapping to decide whether to move ahead with an expensive development initiative. We have a track record of success with GIS mapping projects, the most notable being our relationship with the EOC (Emergency Operations Center). A good small-scale example of a retail application that translates market segmentation and other data into an easy-to-understand 3-D model can be seen here. We tailor these surveys to suit the requirements of our clients for industries such as forestry and telecommunications. These are used for different purposes including urban studies, irrigation management, water mapping, emergency preparedness and planning, custom consumer profile reports and location profitability studies. TriShulla maintains a large facility designed specifically to convert complex records and data into spatial data that supports defined business and operational goals. Since the data entered is only as good as what you put in, our expert staff uses only best-of-breed data conversion tools for transforming paper, digital, CADD and other formats into effective, robust GIS mapping and database applications. 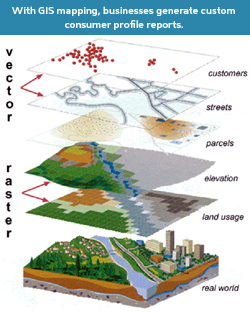 TriShulla offers data creation services and implements photo interpretation, feature extraction and image processing methodologies to develop a GIS mapping database and digital foundation software. For a nominal investment, organizations can rapidly deliver up-to-date geographic and tabular data to government organizations, their staff and the public using GIS technology.